A problem arose when a friend asked me to help him consider a new motor for an Alberg 22, and I began with the basics. We needed (an outboard) motor that would fit in the lazarette, not add weight to the ends, and give better propulsion than the last one, as he had had trouble navigating the current and waves between two concrete breakwalls in and out of the harbour. That brought us to the physics of the problem, and you must remember that physics explains the mechanics of the situation in numbers we can understand so that the subjective opinions of those involved are removed from the outcome. As with any science, units of measurement are important and I will use imperial measurements rather than the MKS system. To move a boat we need to apply a force and apply it for a distance. That is known as work, W = F x d. The units are correctly foot-poundals, but probably mean more to us if we use foot-pounds (ft-lbs), which, for one ft-lb is the force of one pound applied for a distance of one foot. We can also talk of power, which is work done over a time period or P = W/t. The units for power are ft-lbs/sec. This is a fairly small value since it might take us several seconds to apply the force and move the object the distance of one foot. A more normal unit is horse power (HP) which is defined as 1 HP = 550 ft-lbs/sec. Lets consider how far we can conveniently move that boat. With an A30, as with any displacement hull, we are limited to hull speed (HS). The convenient formula is HS = 1.34 x (sq rt Waterline) knots so HS = 1.34 (22.67) = 6.38 Knots. Using Bowditch, 1 nautical mile is 72,913.39 inches, so a speed of 6.38 knots over a time of 1 hour works out to be a distance travelled of 129 inches per second. The only force we can apply to move the hull comes from our power plant, whether the iron horse or sails. Thus the force can only be what we are able to transfer from, in the case of the motor, the torque developed within the motor to the propeller and then to the water. You will notice that the mass of the hull is not mentioned and not a factor to determine work or power! To understand how to apply that force developed by the motor, means we need to know some of the characteristics of the power that the motor develops, such as maximum revolutions per minute (RPM), horse power produced and torque produced. number one consideration when using a motor is to have it running at a speed that is efficient for the motor, which means it is producing the torque it is capable of and the HP it is designed to produce, while using the fuel that is in the cylinder at appropriate RPMs. To run a motor at any RPMs other than optimal RPMs will shorten the life of the motor. To turn a prop at speeds faster than design will cause cavitation or boiling of the water on the blade surface and because steam is compressible, decrease the efficiency of application of force transfer, hence slow the boat. It also shortens the life of the prop. Many of us still have Atomic 4 gas engines in our boats. I have included a graph of the torque and HP curves for an Atomic 4 gas engine. The HP curve is almost linear from 1500 to 3500 RPMs, so any increase in RPMs, will give a linear increase in HP from about 11 HP at the low end to about 20 HP at 2500 RPMs. This is almost a doubling of HP though! For discussion purposes, I will use an output of 19 HP at 2200 RPMs. The only surface area we can use to transfer the force to the water is the propeller blade surface, and so the discussion is now how to get a prop that will do that for us. That includes having the pitch of the prop correct so we can move through the water at our desired speed, while having enough surface area to transfer the developed thrust to the water. Water is a non compressible liquid when confined, but with the top surface open, there is room for extra force to escape. Thus we need to rely on the physics of venturis and Bernoulli's principal for this propulsion, as well as for the slot in the sails. The actual blade design is a very complicated process, and Jim Mennucci has information on that! Pitch is defined as the distance through which the prop will move with one rotation and no slippage. Thus for our A30, at maximum motor RPM of 2200 and no gear reduction, the prop shaft will also turn at 2200 RPM or 2200/60 = 36.667 RPS. Since we now have the shaft speed and the distance travelled at HS in the same time unit of seconds, the prop needs to travel 129/36.667 = 3.51 inches in one revolution. As the RPMs on the motor and hence the shaft decrease, the distance increases. That value is the theoretical pitch of the prop. The important thing to realize is that pitch is independent of prop diameter, and only a factor of HS and shaft speed. It seems that most calculations build in a slippage factor of 55% so the theoretical pitch is increased to allow for this and thus, the 3.51 becomes 6.38. Why this slippage is as large as it is I do not know, but that is the commonly used value. To apply the power generated by the motor to a surface area, I have used an EXCEL® programme called Propcalc.xls that was suggested to me by José Campione of Ottawa. It does a good job of determining the prop disc size based on a 0.33 mean-width ratio, which means 33% of the disc area is blades. Using the above data, and boat mass of 9000 lbs, 17 HP is required on the prop to get to HS. This is the application of the power - force through a distance over time - to the prop surface to get to HS. This may be accomplished by using any of the following props: a 12 - 6 two blade, an 11 - 6 three blade or a 10 - 6 four blade. There was one alternative offered and that was a 10 - 9 three blade. Propcalc tends to round numbers to whole values fairly quickly. Some range is accommodated by 2 rules of thumb that equate 1" of pitch to about 200 RPMs and 1" of diameter to 2.5 inches of pitch or about 500 RPMs. That would suggest that the alternate prop might really be a 10 - 8.5 three blade. If one goes through the math for prop blade area with a 0.33 mean- width ratio, the 2 blade has 37.7" of blade surface, the 11" three blade has 31.67" of blade surface area and the four blade has 26.0 " of blade surface. I have had an evaluation done by Michigan Wheel (MW) for the A30 and their basic rule is to allow for 15% of the prop slot to remain without prop disc in it so the maximum they suggest is a 10" diameter prop. They produce a prop called the MP-2 sailboat prop, which has about twice the blade surface area of regular props. You would need MW calculations, because Propcalc has the mean-width ratio fixed. Janski has one of these props on Viva II, but has not yet had it in the water. It should also be pointed out that if you are using a big diameter prop that you thought would be more push; you might want to reconsider the numbers. If you are using a 12" three blade instead of a 10" three blade, you have cut the motor RPMs by almost 1000, and by doing that you have drastically cut HP developed. Once you have done that, there is a much more limited amount of power produced to apply and hence, the pitch will need changing, and the motor will have suffered because you will be lugging it and in all probability, not completely burning the fuel. It all shortens the life of the motor. Things get to be really critical if the RPMs are lowered to the point where lubrication is impaired. No motor lasts without oil. The last thing I want to mention is the force of resistance. Everyone wants more ability to motor against wind, waves and current which we often call power. In our example above, we had about 2 extra HP available from our Atomic 4 so, in fact, power is not lacking. Trying to be accurate or precise in measuring resistance is really difficult, not the least of which is because of the roughness of the hull with different antifouling surfaces. What we have accomplished above is to use power to move a displacement hull in a fluid. We have assumed that we could move at HS, so that would be at relative HS to the water. If for whatever reason, wind, water, hull drag or current, all the forces against the direction we want to go add up to enough to move the boat at 129" per second, we are not going to move in the direction we want, in fact, we go nowhere. It is not the limit of the motor that is against us, because we still have 2 HP in reserve, but the limit of HS that is against us. It is time to put up the sail and bear off. The fact that waves are not a consistent force does complicate the force against us, but the fact remains it is HS not power that is limiting. Change to an Alberg 37, or dare I say it, a Whitby 42. The other option is to anchor, but it might be a bit of a rodeo and a goodly length of chain rode might help to hold her. I for one have difficulty understanding how some skippers can say that a three blade prop is definitely better than a two blade prop when no other specs are given. I have the impression they may be comparing two different things. Getting the correct prop for the motor and boat is the challenge. 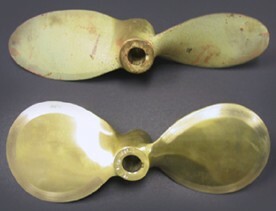 There are choices, and for me, I would rather have less resistance when sailing, so a two 2 bladed prop, but I don't expect power transmission performance to be compromised if I have the correct surface area and pitch. The one place the mass of the boat does enter the picture is in the momentum formula. When both blades are behind the keel, I am relying on momentum (mass x velocity, where velocity is a directed speed) for instantaneous forward motion in the direction I want to travel, rather than an exposed blade taking another bite. (The units of momentum are also ft-lbs/sec.) With an A30 at HS, momentum is a real friend for this. As always boating is a compromise but understandable numbers clarify the decisions.